When I had taken this photo a year ago, I knew that I would like the final result, not perfect, but it has that bit of “soul” that I always want in a photo. Originally I had stopped to take a photo of just the shack, then my daughters and niece came along playing around it, as Christine climbed in and sat, I decided that this was going to work even better. The title came from some random thoughts jumping around my head, originally I wanted there to be a reference to the type of hut; it’s a fisherman’s hut by the ocean, but no title immediately popped to mind. As I thought about it, the phrase “Fishers of Men” came to mind (a phrase used by Jesus in the Gospel of Matthew), but with the girl in the photo, that didn’t work, then her name correlated somewhat with that idea, Christine, from the word Christ (as in Jesus Christ), and then it suddenly dawned on me that Jesus was often referred to as the son of a Carpenter, and Christine’s father is a Carpenter, so voila! It’s a stretch, but it works for me. 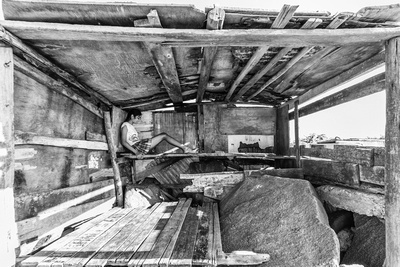 The Carpenter’s Daughter | 2015 | Canon EOS 60D, Sigma 10-20mm | Lusignan, East Coast Demerara, Guyana, South America. 🙂 good. Go for it. As soon as I saw the title I thought it was possibly a (maybe blasphemous) reference to the big JC. It’s an unusual composition in that the girl, the carpenter’s daughter, doesn’t hold a prominent position in the scene. I think of our human habitats that are crumbling around us, that offer only a minimum of protection for our daughters. May be it can also speak to the way women are treated in society. I think she was brave to go in the “hut”. Looks like it once had a concert slab floor. wonder what moved it from it’s original place. Nice work Mike.